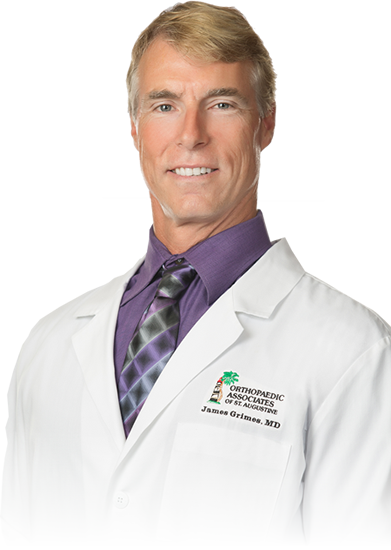 Dr. Grimes is a graduate of The University of California in San Diego and Northeastern Ohio University College of Medicine. Dr. Grimes holds two Board Certifications with the American Board of Orthopaedic Surgery -one in Orthopaedic Surgery, the other in Sports Medicine. He was the first Orthopaedist in St. Johns County selected for the Academy of Arthroscopy of North America and brought Computer Navigation of Joint Surgery to to Flagler Hospital, where he is the current President of the Medical Staff and Orthopaedic Medical Director. Dr. Grimes cares for professional, collegiate and high school athletes as well as specializes in sports medicine and reconstruction of the shoulder, hip and knee.